Seems like, the carbon composites material particularly designed by Boeing team keeping the safety of its passengers in mind could not prevent them from stopping a glitch in the landing gear in the new Boeing 787 Dreamliner. 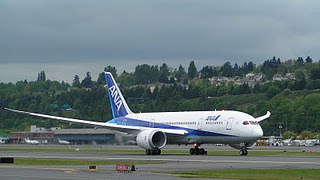 The inaugural delivery of two Boeing aircraft to ANA underwent less than 2 weeks ago and now the glitch problem in the landing gear has forced the Pilots to deploy the landing gear using a manual backup system, after an indicator lamp suggested the wheels were not properly down. As reported via Yahoo India, “We are not yet sure what the problem was, but we are investigating,” an airline spokesman said, adding that Boeing was also involved in the investigation. Kyodo news agency linked the problem to a hydraulic valve, but Boeing declined to confirm the cause. “This glitch shouldn’t have any impact on customer perceptions of the 787, as long as Boeing aggressively pursues its investigation and implements any needed fix,” Aboulafia said. Well, it seems like the start to the fairy tale story of Boeings 787 dreamliner has met with a landing break. It took Boeing many years to design the 787 dreamliner. And also, they delayed the delivery of the aircraft for 3 years, just because they wanted to make sure they had the perfect design of aircraft for their customers. But in reality though, not everything is perfect, Not even Machines!